CALA Homes (East) and Wheatley Group deliver “Gateway to the Pentlands” sign in Balerno. 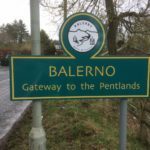 Two organisations delivering homes in Balerno have come together to provide the village with bespoke new gateway signage announcing it as the “Gateway to the Pentlands”. For more than three years, the desire for new signs has represented a key element of thinking behind the community council’s draft community plan to increase pride in place, after a household survey by the village trust highlighted broad support for improving on the original “standard black and white” signage. However, that new welcome into and out of Balerno could not be fully realised until CALA Homes (East) and Wheatley Group got together to arrange for the installation of the new green and yellow signs. Richard Henderson, Chairman of Balerno Community Council, said: “These signs make for a greatly-improved welcome to our community. “New housing development at Ravelrig and Newmills presents new challenges and opportunities for the community, and encouraging ‘pride in place’ is, we think, an essential element in ensuring continuity for the village at an important time as it changes and adapts. CALA Homes (East) is currently selling homes at two developments in Balerno, Ravelrig Heights and Kingfisher Park – and has had a lengthy history within Currie, Balerno and the surrounding areas. Derek Lawson, Strategic Land Director with CALA Homes (East), said: “We know how important these touches are, so we’re pleased to be able to help with the purchase of the signage. “We understand we are a visible part of this community and want to bring benefit to the wider area surrounding our developments. Dunedin Canmore, part of Wheatley Group, has recently completed 21 new affordable homes for mid-market rent and are due to finish a further 18 shortly. The mid-market homes will be let and managed by Dunedin Canmore’s partners in Wheatley, Lowther Homes. Mid-market homes typically have rents below the local market rates and are designed to be an affordable option for those who can’t afford to buy but have no priority for social housing. David Fletcher, Wheatley’s Director of Development, said: “We’re delighted to have built these spacious and energy efficient new homes for mid-market rent.